Sometime back, when I travelled to Chilika Lake (Lagoon), I got a unique chance to educate children as well as experience nature, both of which I adore. It was a nature camp and I was sent there officially to educate the children about nature and its significance. It’s always cool to teach children, especially those at elementary and secondary school level. They are charming, inventive and most importantly mischievous. As part of the nature camping programme, we are advised to stay within the limits of any protected natural landscapes, viz-a-viz wildlife sanctuary, reserved forest or national park. We stayed in the midst of a lavish green backdrop encompassed by a variety of species, resident of Chilika. The ever-soothing early morning breeze flows alongside the twittering and chattering cries of birds and little creatures. Chilika Lake is the biggest brackish water lake of Asia found along the Coromandel Coast of peninsular India. Being declared one of the six wetlands under the Ramsar convention, it offers a great deal of scenic beauty. Furthermore, this picturesque locale is a safe haven for diverse aquatic life forms such as birds (both waterfowl and waders), fishes, crabs, etc. We organized a birding trip to the nearby island, Nalbana. Boats were arranged for the trip. 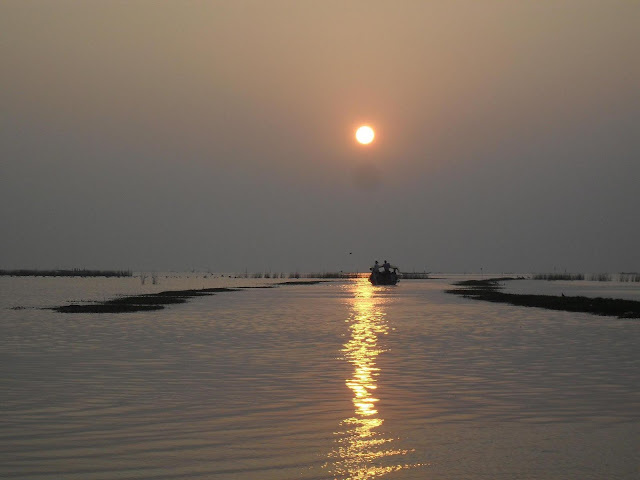 Nalbana is a wonderful island with vast life forms situated at the heart of Chilika Lake. The children jumped out of joy as the boat surged through brackish water and moved forward. We tried to arouse their interest by showing them some beautiful creatures like Irrawaddy Dolphins, Seagull, Gull-billed Tern, Pied Kingfisher, White-bellied Sea Eagle, etc. The children were given binoculars to observe the birds. Some of the kids were curious, questioning the open-feather stance of a bird. It was a Cormorant. Unlike other water birds, cormorants do not have wax coating around their feathers. So it stays under the sun with its feathers open to get dry. This in turn looks striking and attracts students, birders and photographers. The children were so thrilled watching the hunting behaviour of terns and kingfishers. As we paddled through the lake, we saw a huge flock of Ruddy Shelducks taking off, sensing us (strangers). Northern Pintails, Shovelers and Gargeneys accompanied them shortly. It was beyond belief to spot all these wonderful creatures at the same time. Children looked absolutely thrilled. After an hour long journey, we reached the island. The forest officials briefed us about the island and its significance. Nalbana Island was declared a bird sanctuary in 1973. It serves as a massive wintering ground for birds. One can see over thousands of birds hysterically foraging the mudflats during the season. The best part about this island is, it vanishes during the monsoon season due to heavy showers and resurfaces back once the water recedes. The children were taken to the watch tower, where they got to watch the birds through high range spotting scopes. Watching the peculiar behaviour pattern of larger and smaller birds, the children’s curiosity piqued. The larger birds include greater and lesser Flamingos, Herons, Egrets, Pelicans, Storks, Ducks and Ibises. The smaller birds include Stilts, Terns, Sandpipers, Ruffs, Snipes, Lapwings, Coots, Teals, etc. They even saw a few raptors like Sea Eagle, Kites and Falcons. As they were curiously screening the birds through the spotting scope, one of the children shouted out an alarm. He informed us that he has spotted a bird which has a white head with dark eyes and sharp beak pointed downwards, brownish feathers and pale yellow coloured legs with talons. It was clear that the bird he was describing about was the Brahminy Kite; we were startled by his acute observation. He continued further that the bird had repeatedly fallen into the water while attempting to take off. He sounded very concerned about the bird and its condition. We responded quickly by taking a look at that bird through the scope and witnessed the same scene as narrated by the boy. Immediately, we informed the forest officials, who after observation told us that the bird was injured. The feathers were wounded because of which it was struggling to fly. Without wasting much time, their team rushed to the spot and rescued the bird. The Forest Ranger and Divisional Officer appreciated the boy for his intuitive observation and quick thinking. They presented him the famous book “The book of Indian Birds by Salim Ali” and encouraged him to do bird watching regularly. It was pleasant surprise for the boy and also for the entire group. Overall, it was an enchanting experience in Nalbana both for the children and us (educators). It was one of my most unforgettable experiences with children and nature. Thank you for reading. Really appreciate your time. Would be great if you could share your thoughts about the article you just read. Will be happy to discuss about it. Little bit of discussion helps! Always! Water bodies - Water carriers or Waste carriers? I came across this statement and it had prompted a long disturbing thought deeper inside me on the state of water bodies around us. Be it a well, a pond, a lake, a canal, a drain, a river, or even a sea, everything wears a mask. A mask which is least expected, unpleasant and destructive. It seems like a fantasy story to say that most of these water bodies had directly fetched fresh water serving as an open source near to us. Most of our parents and grandparents used it for drinking or washing or cooking or bathing or any other domestic purpose. We would have heard them talk about it or even some of us would have experienced the neighboring water bodies to be usable and is now either dry or full of ‘unusable’ water or had disappeared. Had we given a thought on where does the fall of neighbourhood water bodies start from? Dumping wastes, be it solid or liquid, it starts here. Flamingo it is! Gorgeous greater flamingos flock together at Ousteri Lake, Puducherry between mid or late June till September every year. They arrive here once the water level drops as the lake serves a massive feeding ground with variety of food. Watching these adorable creatures is a feast to our eyes. Their delicate elongated neck, curved head with downward positioned beak makes them distinctive. They feed on algae, diatoms and sometimes even crustaceans like shrimps, prawns, etc. Thus the pink colouration, which is predominantly caused by beta-carotene due to its diet preferences. The other day (last week of August) when I visited the lake, I saw spot-billed pelicans in huge numbers (around 500 approx). They were busy feeding the cat fishes along the banks. You could witness this yourself at Ousteri lake, most frequently before 6 am depending upon the human activity.